SANTIAGO, Chile (CNS) — The playground at the Salesian-run school is filled with children in brightly colored swimsuits, laughing and screaming as young Catholic volunteers spray them with water in the 100-degree summer sunshine. The children range in age from 6 to 12. They are participating in a weeklong summer camp, which helps children from vulnerable backgrounds have fun during their summer vacation and brings them closer to the Catholic Church in preparation for Pope Francis’ Jan. 15-18 visit. The camp has special sessions to prepare for the pope’s visit. “What have we learned about the pope this week?” Alfaro asked one recent day as the children got in a circle to sing and pray. “His real name isn’t Pope Francis — it’s Jorge Mario,” said one excited little boy in a red T-shirt. The children are learning that the pope is Jesus’ representative and he is coming to spread a message of peace and joy. About 130 people at the camp are grouped according to their age. Each group has a teenage Catholic volunteer, dressed in a brightly colored orange T-shirt, who also attends the school. Vicente Inostroza, 17, is one of the camp’s volunteers. During Pope Francis’ visit, both Inostroza and Alfaro will be going to a huge gathering of young Catholics at the National Shrine of Maipu in Santiago. 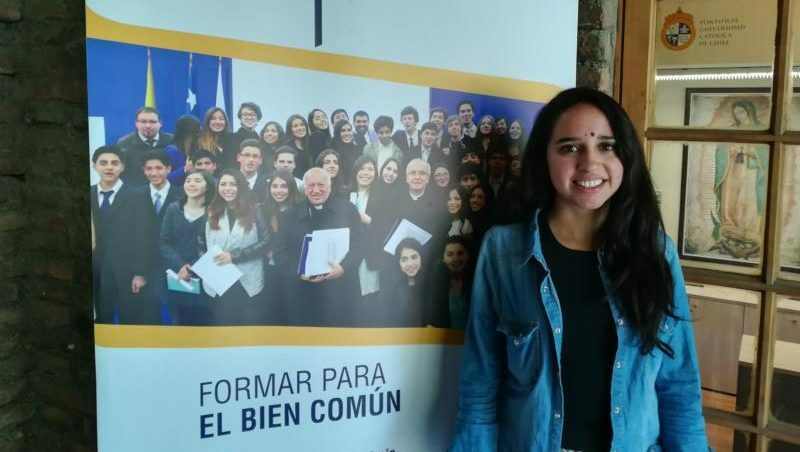 Alfaro was recently part of a panel of young Catholics talking to the archbishop’s office about their views on being a young Catholic in Chile. Pope Francis has dedicated this year’s Synod of Bishops to the theme of young people. Another young Catholic on the panel is Ignacio Leiva, 22, a volunteer for a group called Catholic Voices, which tries to get Catholic opinions heard in the mainstream media. All the young people on the panel agree that being a Catholic in Chile is tough because, after various scandals, many people in society have stopped trusting institutions like the church and the government, and it’s a struggle to get young people to connect with the church. “Today people my age feel very alone, and that’s why we are always on social media. We want to feel part of something. And today the church doesn’t offer people enough to help them feel they are part of a group,” said Leiva. He said although there are many youth movements, the church needs to work more in the parishes to get young people interested again. He said he knows it is a problem because fewer people are becoming priests. He said he wants to see a wider variety of activities and services in the parishes to try to engage young people, but added that the young people need to be more proactive. “For too long we have thought our job was to listen to older people and do what we were told — things like moving chairs about — but we need to be more dynamic,” he said. He also said he hopes the pope’s visit will inspire his generation to take control. “The pope is coming here to tell you that you are not alone and that is very important, so it will be a whole bunch of young people all together with the pope, and I’m sure that people who go to the gathering at Maipu will feel different afterward,” he said. Another panelist, Valentina Toro, 25, works for the Academy of Catholic Leaders at the Pontifical Catholic University of Chile, which Pope Francis will visit Jan. 17. Toro is a member of the Catholic charismatic renewal movement and thinks this is the way to modernize the church and make it more interesting for young people. Toro said she is happy that Pope Francis, an Argentine, is coming to visit. “He really understands our Latin America, which is great. And he is so friendly and easy to relate to. Young Catholics always complain that we are never consulted enough, but now the church is listening to us, and that is wonderful,” she said. Young people – they are the future leaders of our Planet.